When I was little, our neighbour had a huge cumquat tree that used to hang over our side of the fence. I loved them. I hadn’t seen them for years until I visited a friends house and they had a tree full of ripe fruit. I excitedly grabbed a handful and popped them straight into my mouth. I got some strange looks, most people don’t realise that you eat them skin and all, it balances out the sourness. Regardless, my friends still weren’t fans, and sent me home with bags full of cumquats. I made so much of this marmalade, and still struggled to get through all of them. The marmalade made great gifts that year! Cumquats only come out for such a short time each year, and I missed them completely last year. I found some in my local greengrocer on the weekend, so I grabed a bag full. 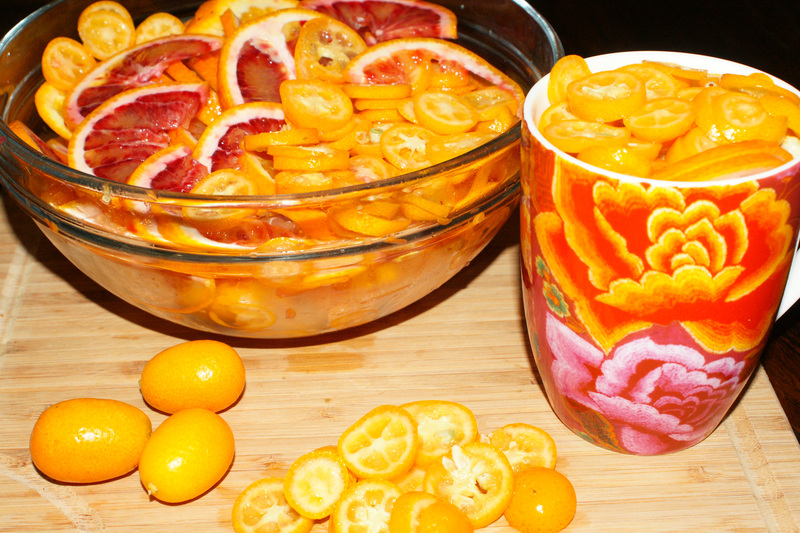 They make a beautiful marmalade mixed with blood oranges. I try to make a batch each year and put a jar aside for Christmas, it makes a delicious Christmas ham glaze. Every year I make the same mistake, I’m hoping someone else can learn from my mistakes, since I don’t seem to be able to. Don’t give into the temptation to make a double batch – firstly, you need an enormous pot to fit it all in once you add all the sugar, and secondly, it takes FOREVER to get to the gelling stage. When I sat down this morning to a nice piece of pumpkin bread, with a thick smothering of home-made marmalade, it made all the time and effort worth it! If you are looking for a fabulous brand of gluten, dairy, egg, yeast & soy free bread, try Zehnder. I get mine from my local IGA. 1) Slice the cumquats and oranges. 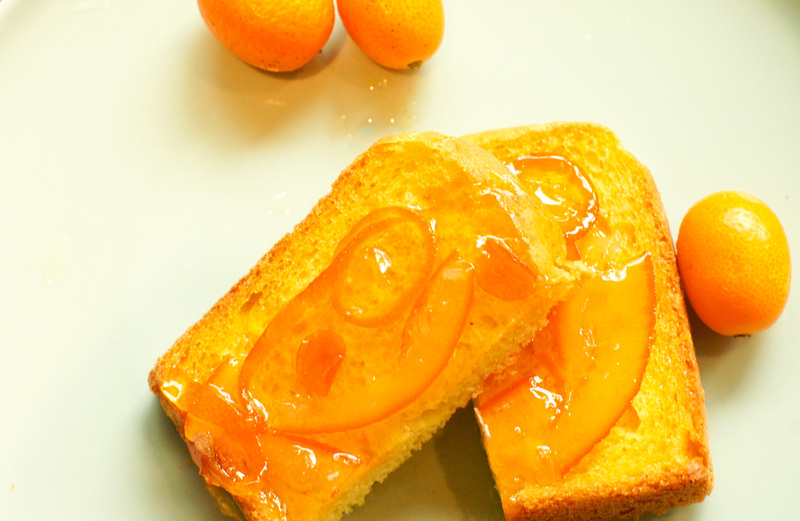 The skin stays in your marmalade, so try to make the slices thin. Combine the sliced fruit in one bowl. 2) Using a cup, measure the amount of fruit, pressing down firmly. Transfer each cup of fruit into a large saucepan or stock pot. Remember how many cops of fruit you used. 3) For every cup of fruit you have in the saucepan, you need to add 3 cups of water to the saucepan. Let the mixture stand in a cool place overnight (12 hours minimum). I generally cut up the night before, and don’t come back to it until the next night. 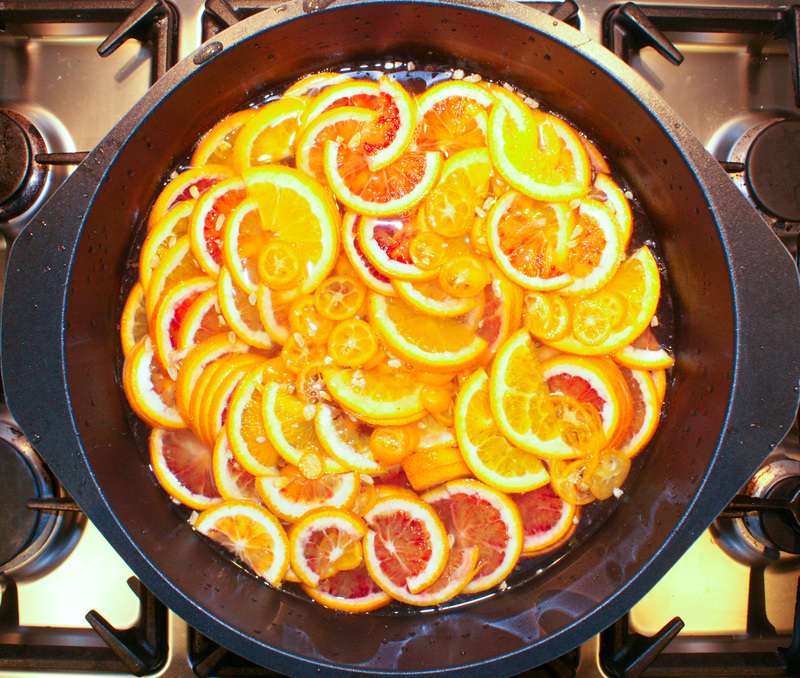 4) Bring the mixture to the boil, and then bring the heat back to a simmer until the fruit rind is nice and tender. 5) Let the mixture cool, and then using a cup, measure the cooked fruit. Return the mixture back to the saucepan, and then add one cup of sugar, for every cup of fruit you have. Add about 3 tablespoons of lemon juice and a teaspoon of sea salt and stir through. 6) Return to the boil again. Let the mixture continue to gently boil, stirring occasionally until the mixture starts to gel. (Using a wooden spoon, you should be able to get a good covering on the back of the spoon. You will know when the marmalade is ready, when you can run your finger over the back of the spoon, you should see a clear line where your finger went through.) The temp will be about 105c if you prefer to check with a kitchen thermometer. 7) Transfer the mixture to sterilised jars and seal immediately. 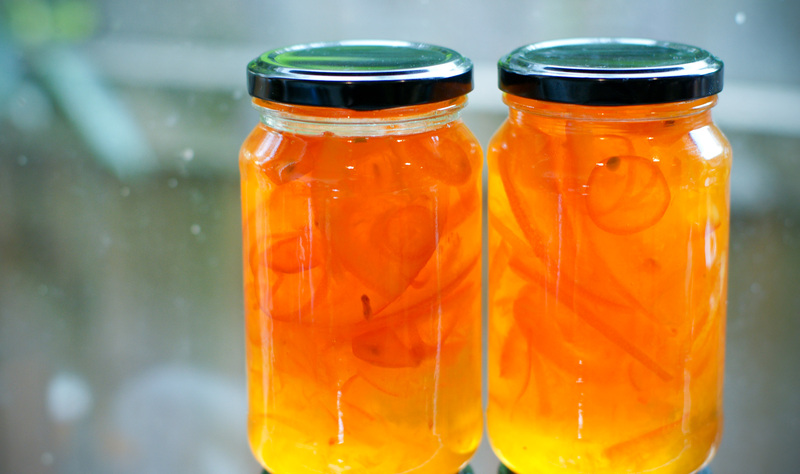 As long as the jars seal properly, the marmalade will keep for months, until opened. Once opened, keep refrigerated. 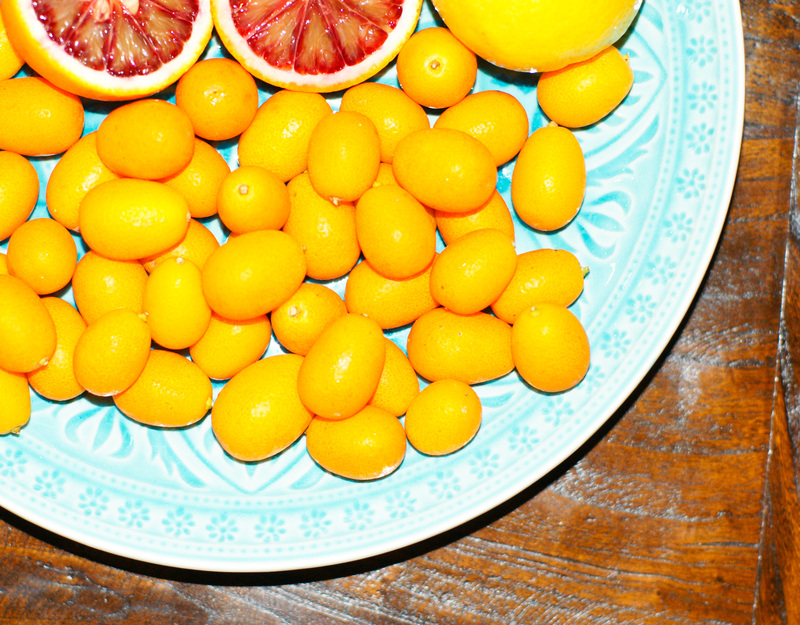 Tips – Put the seeds from the oranges and lemons into a muslin cloth and tie a knot in it. Pop this in the the boiling water in step 4, to add extra pectin to the mixture, take it out before jarring. Follow these tips for sterilising your jars . To tell if your marmalade is at gelling state, place a plate in the freezer before you start step 6, place a spoonful on the cold plate to test. If it is ready, you should be able to push the mixture, you will see wrinkles form. 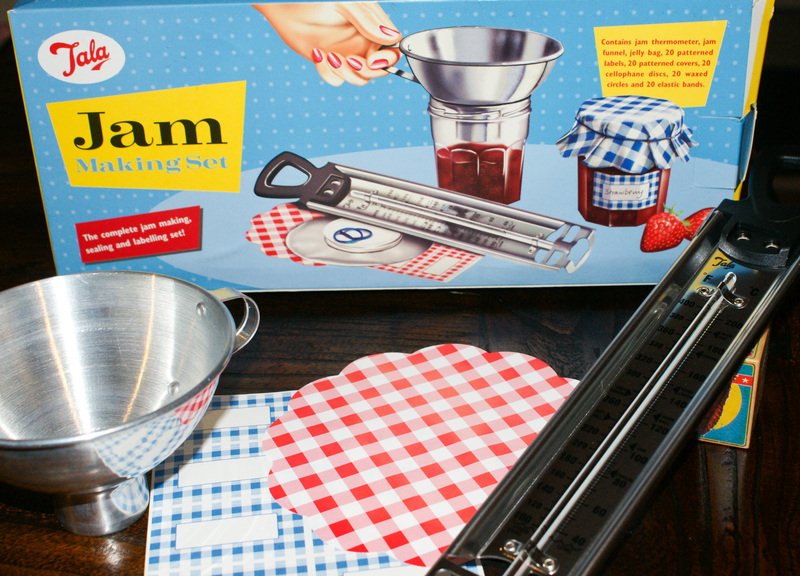 I bought this gorgeous jam making kit, I found it in a damaged box discount bin – how cute is it? I was very happy to have it too, I’ve never used a thermometer, or funnel before, so you don’t need them, but the funnel makes it so much easier, and a lot less messy. I love your pictures! They always look so beautiful! The only time I had cumquats was in South Korea. I had never seen them before and I didn’t know how to eat them because they were so sour. I never thought about making jam from them. Such a great idea! I love this on toast, yummy. I’m going to try this, looks delicious !